Bequests to the high altar in the church of St. Andrew there, and to St. Thomas's light, St. John's light, and Our Lady's light [in the same church]. Also to St. Erasmus' Gild in Fulmerston, to the Freers in Walsyngham, to poor householders in Ryburgh, Gild brethren and sisters, to priests &c. for dirges, "to every child that can say De profundis ld.," for a light before Our Lady in Ryburgh church, &c. To Emma his wife, his place in Ryburgh, &c. To Robert his son, 40s. Other children mentioned. Sir Geffrey Howes, vicar of Little Ryburgh, and others to be executors. Moneys for repair of the leading of the church and bells. The inventory of Edward VI in 1552 lists Ryburgh as having “1 stepelle belle wayeng by estimacon 5 c(wts)” as well as “2 hand belles, a sacryn bell and a sancts belle” all weighing around 20lbs or less. TO THE GLORY OF GOD AND IN LOVING MEMORY OF OUR FATHER AND MOTHER. “and to be charged for at the rate of £5-7-10d. per cwt. Warranted cast of pure Copper and Tin as specified by Lord Grimthorpe. Clappers, fittings, ropes, framework and fixing the whole complete in the tower- leaving the bells in first class ringing order-as per specification on page 19 of catalogue. The cost of all this was £367 -7 – 4d. £8 – 0 – 0d. 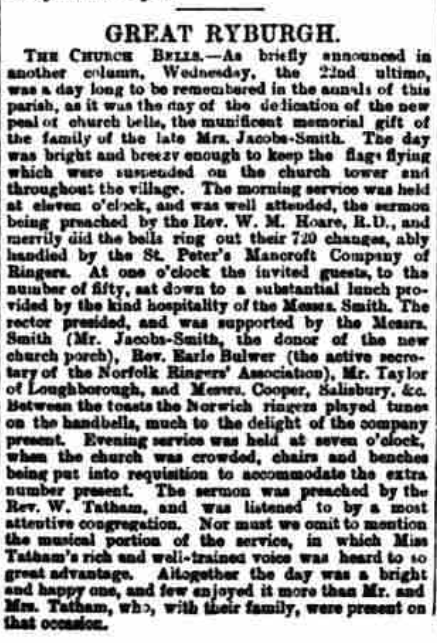 It is scarcely fit for men to be at work in a Church tower during such severe frosts - We hope that there will be a change so that Smith may go to Ryburgh on Monday next”. Although the floor was altered, (most probably when the new organ gallery was added in the restoration of 1910-1912) the now blocked trap door is still visible beneath the feet of the ringer of the 4th bell.